It’s Speedy Tuesday! This week we have an interesting Omega Speedmaster for you, the reference 105.003-63. That’s right, one of the very first models of this reference number. The Omega Speedmaster 105.003 is considered to be the 3rd generation of Speedmasters, as the CK2915 and CK2998/105.002 (basically the same watches) are its predecessors. The interesting part about this particular Speedmaster is that it still has the Alpha hands that were also on the CK2998 and ST 105.002 references. Most of you will know the 105.003 as the first watch with the white baton hands, as pictured below. However, these official database results from the Omega website also tell you that the 105.003 was delivered with Alpha hands. When collecting vintage Omega watches and specifically Speedmasters, you will find – more than once – that it is not exactly easy to put everything into a certain table or overview. It seems that Omega was not always that strict when it came down to using parts when assembling watches. Perhaps the most famous example is the Speedmaster Professional transitional model in 1968, featuring a caliber 321 dial (applied logo) but using the newer Lemania based caliber 861 movement. I guess that these very first 105.003 references also were subject to ‘finishing up the parts we have’ and therefore applied with these Alpha hands. However, that’s an assumption of course. The current owner of this Speedmaster 105.003 bought this particular model for one simple reason, he fell in love with the ghost bezel (faded inlay) and wonderfully aged hands. Since about 3 weeks, he is the owner of this wonderful early bird 105.003 and completes his already impressive collection of a CK2998-2, 105.012-65 and 105.012-66 references. The Speedmaster 105.003-63 is being worn on a JB Champion bracelet, just like the NASA astronauts were during at the time of the Apollo programme. I’ve told this before, but according to James H. Ragan (former NASA employee and responsible for selecting the Speedmaster to become the Moonwatch) the astronauts used this particular bracelet because it snapped quite easily from the watch. There was no way they would risk losing their hands over a watch or get stuck behind an obstacle otherwise. In the meanwhile, these bracelets became quite sought-after amongst Speedmaster fans who love the history with NASA. A straight-lug Speedmaster case, caliber 321 column wheel movement, Alpha hands, a faded bezel and discoloured tritium hour markers and hands. 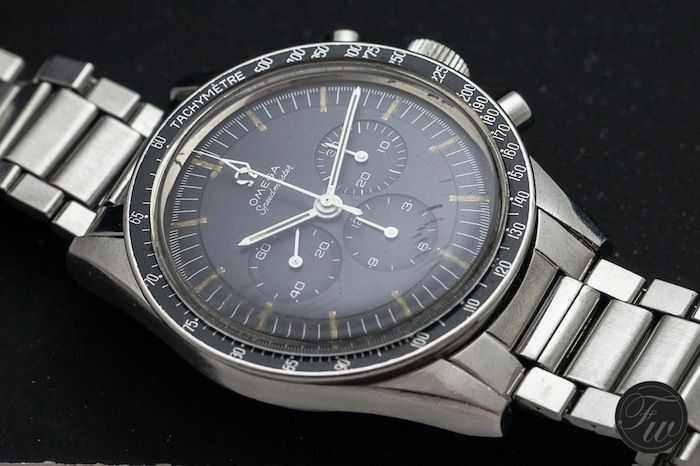 Just the way a lot of vintage Omega Speedmaster collectors like them. More pictures of this particular watch can be found in this thread over at the best Omega forum around. Thanks P. for your contribution to Speedy Tuesday! Much appreciated.